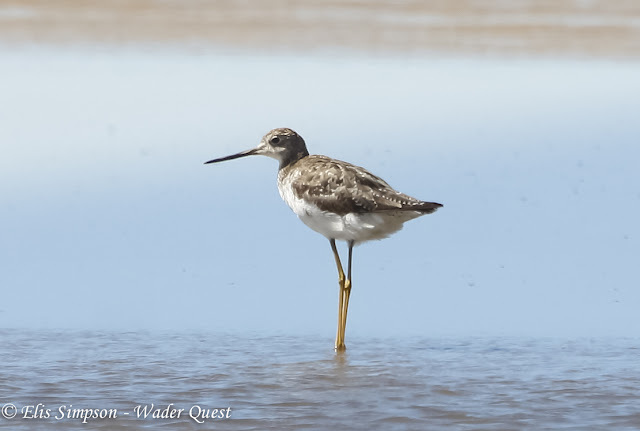 Wader Quest: New world waders in an old world setting. New world waders in an old world setting. The pull of not one, but two Nearctic vagrant waders to see so close to each other on the southern shores of the UK, was too much to resist. We had managed too suppress our desire to go and look at the Greater Yellowlegs for some time, but it remained long enough in the area that when a Hudsonian Whimbrel showed up just along the coast, we were unable to resist any longer. Picking up Wader Quest Trustee Oliver Simms on the way we sped down to Pagham Harbour to look first for the Hudsonian Whimbrel. The view that greeted us on arrival. A line of birders, but all looking in different directions and not using their scopes. Not a good sign. When we arrived it had disappeared from view somewhat predictably but after a fairly protracted wait, old friend Barry Reed came dashing past saying that the bird had just flown into the long grass away to our right. A short search revealed a brief view of a head and shoulders of a whimbrel, but was it 'our' whimbrel? It certainly looked a likely candidate and we didn't have to wait long to find out, it took flight and flew across past the admiring crowd and we were all able to see the distinctive lack of white on the lower back and the cinnamon hue to the underwing; magic. The downside was that it settled in more long grass at a greater distance. This bird was the 9th record for the UK the first being in 1955 on Fair Isle. Hudsonian Whimbrel Numenius hudsonicus was split recently (by some but not all authorities) from Eurasian Whimbrel Numenius phaeopus and they can be separated in the field with careful observation. The two photos below demonstrate some of the features; Hudsonian shows a more contrasting head pattern; Hudsonian has a slightly longer bill; Hudsonian is more buff on the underparts; Hudsonian is darker on the upperparts. What these photos don't show is the cinnamon underwing of Hudsonian and the best known feature, the lack of white on the lower back. Hudsonian Whimbrel Numenius hudsonicus USA (left) and Eurasian Whimbrel N. phaeopus The Gambia. The only other waders seen were Common Ringed Plover and Eurasian Oystercatcher. With that success under the belt we decided to go for our second target for the day, the Greater Yellowlegs. At Titchfield Haven a pleasant walk along the canal path to a shallow lagoon soon had us watching a sleeping Greater Yellowlegs Tringa melanoleuca along with a fair number of other birders many of whom we had seen at the Hudsonian Whimbrel. The gathering for Greater Yellowlegs at Titchfield Haven. We stayed for some time and got some brief 'head up' views and the odd wing shuffle, but little else in the way of physical activity, maybe it was still tired from flying across the Atlantic, I know I would be even though it was ages ago. Greater Yellowlegs Tringa melanoleuca (centre in front of the only godwit not sleeping; erm... with the yellow legs) among Black-tailed Godwits Limosa limosa. It spent most of its time sleeping during our visit. Occasionally though it did raise its head, but you had to be quick to see it let alone photograph it! The yellowlegs was passing its time in among around 40 Black-tailed Godwits, some of which were slumbering too, others, were feeding more actively. Greater Yellowlegs Tringa melanoleuca photographed in Mostardas, Rio Grande do Sul, Brazil; October 2013.